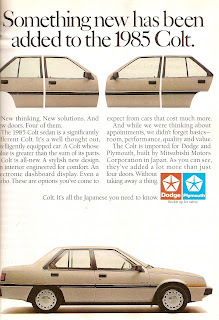 Behold my most recent automotive obsession: the Dodge Colt and Mitsubishi Tredia Turbo! 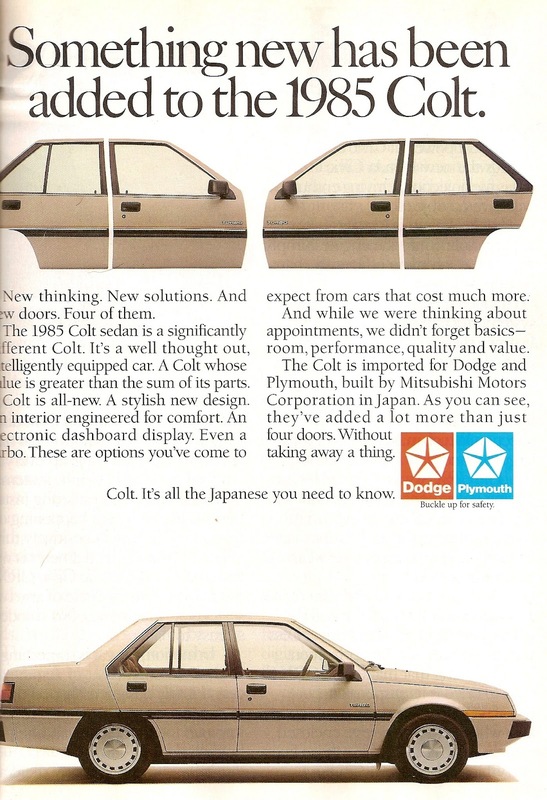 With an ad tagline more aptly found written in flickering neon on the side of low rent all-you-can-eat Japanese Steakhouse Buffet, Dodge wasn't too keen on people digging too deep into this whole Japanese car fad. A Colt was probably a step above an Aires in quality and fuel consumption but heaven forbid prior Dodge customers on an economy kick start to look beyond the Diamond Stars. But who cares about quality and fuel economy? The Dodge Colt Turbo was a fast car for the day. With high eight second 0-60 times, it was every bit as fast as an IROC-Z, 325es, or GTV-6 or pretty much anything sold in 1985. If anyone has one of these, feel free to drop me a line. FYI, because of the two-speed transfer case, this thing has two reverse gears. That makes it faster than anything else on the road when going backwards. That's a little bit of info shared by a former coworker back when I sold Hondas. The guy had a Z06 Vette, but all he ever talked about and most days all he ever drove was his 8-speed twin stick turbo Colt.